If you are looking for a new home, you are in luck! At VAPF, we want to welcome owners and future homeowners to our Open House at Cumbre del Sol Residential Resort during the Easter holiday. If you live in the area or come here on holidays, you will have the opportunity to fall in love with our homes and find your very own. If you are already a homeowner at Cumbre del Sol Residential Resort, this Open House is also for you. Come and discover our latest developments first-hand. The meeting point will be Villa 109 at Lirios Design, where we will be from April 15th to the 20th from 10:00 a.m. till 6:30 p.m. with uninterrupted hours. Note that you do not need to book an appointment with us! Come whenever you feel like it during the hours listed above; we will be waiting to show you our homes. You can also enjoy a glass of sparkling wine (cava) while discovering the oceans views that our homes offer! If you are looking for a modern luxury apartment, you should stop by and see Montecala Gardens! We have several models starting at €217,000 and you will be able choose the distribution that best suits your needs. All of them include 2 bathrooms and 2 bedrooms, as well as common areas with a swimming pool, children’s playground and green spaces. Come join our Open House if you want to hear about its sturdy design and the quality of its finishes in more detail! If you’re looking for a new home, you’ll fall in love with our Jardines de Montecala apartments! These fully equipped homes have everything you need to live your life to the fullest on the Costa Blanca: apartments with terraces and full common areas that include several swimming pools, among many other things. These apartments are ready to move into, so if you want to enjoy your new home this summer do not hesitate to contact us. If you are looking for a luxurious villa facing the sea, with our great selection, you will easily find the one that best suits you! In our Lirios Design development, you will discover several housing models, so you can enjoy your new oceanfront life to the maximum. The Mikonos model, for example, has 3 bedrooms and 2 bathrooms, incredible views of the Mediterranean, a private pool, and a large terrace. In the Siros XL model, you will have a bright home with large windows distributed over two floors with 4 bedrooms and 3 bathrooms. Among the new models at this development, the Creta model stands out, with its master bedroom which includes private access to the terrace. It also has an extra area at the back for you to create a space that’s your very own. In our Lirios Sunrise development, you can find the Albor model. It is a modern style villa that perfectly fuses the interior and exterior of the home, creating spaces that are both functional and full of natural light. But we have other news! You can also discover the new model, Villa Solmar, that has 3 bedrooms, several bathrooms, a garden, terrace, grill, and everything you need to begin your new life at Cumbre del Sol Residential Resort. If you are looking for a new home on the Costa Blanca, do not think twice! At Cumbre del Sol Residential Resort, the home of your dreams awaits you. Stop by the Open House that we will have this Easter holiday. A friendly reminder that we will be here from April 15th to the 20th from 10:00 a.m. to 6:30 p.m. For more information, fill out our contact form. Come visit us! 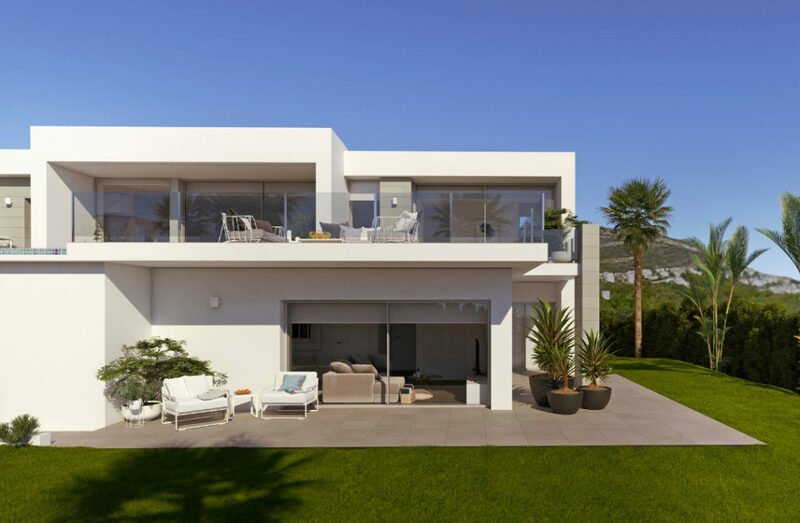 VAPF continues with the construction of luxury developments on the Costa Blanca, homes which are adapted to fit our clients’ tastes and needs with a constant focus on the quality, style, and exclusivity which characterises them. 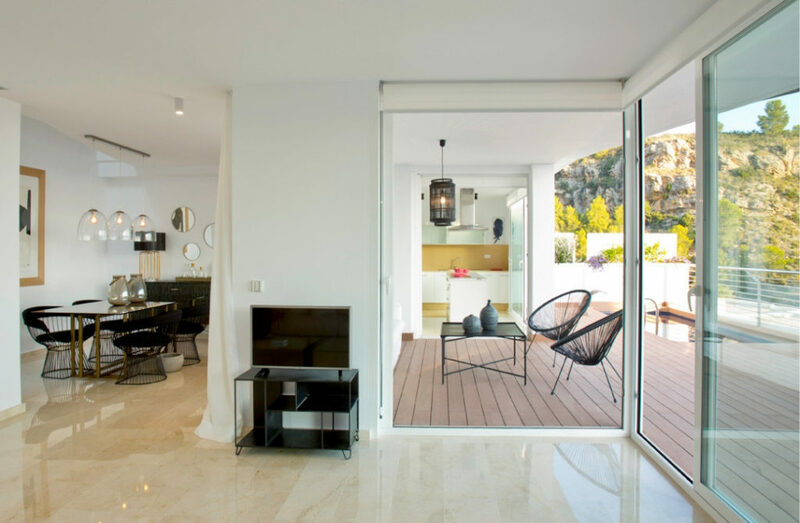 Among our latest developments we have the luxury Montecala Gardens apartments, whose location in a natural environment and full communal areas make them the ideal place to enjoy the Costa Blanca at any time of year. 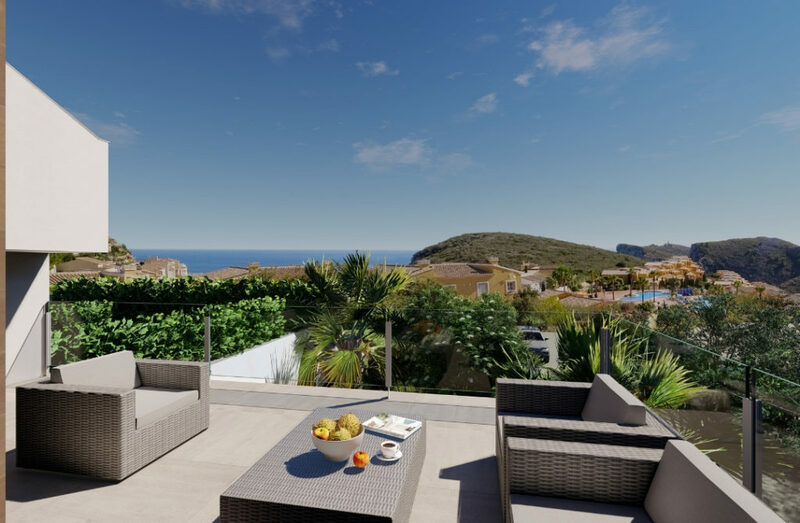 These new properties are situated in Cumbre del Sol Residential Resort, in the Montecala zone, close to incredible beaches and coves as well as tourist locations on the Costa Blanca such as Moraira and Javea. These apartments have two bedrooms and two bathrooms so can adapt to any type of family, whether that’s couples or families who want a space that’s right for them. As is normal in VAPF projects, in these homes there is an exclusive decoration and interior design project, paying maximum attention to the smallest of details. Everything is designed to make the most of the climate and the Mediterranean lifestyle, and to enable those who live in Montecala Gardens apartments to enjoy them with every comfort available to them: there is an open kitchen connected to the living-dining room and a large window which floods the space with light. All these properties have a private terrace from which to enjoy the Costa Blanca’s climate, and a garden for properties on the ground floor. Without doubt, one of the greatest attractions of this new luxury apartment development is the communal areas. There are three pools, spacious terraces where you can sunbathe, garden areas, and children’s play areas as well as a social club. With all these facilities available to you, the new Montecala Gardens apartments are the perfect choice to begin a new life on the Costa Blanca in the incredible Cumbre del Sol Residential Resort. Montecala Gardens apartments start from €217,000. If you need more information about the different options available, fill in our contact form and we will get in touch. Spring has sprung! Enjoy spring at Cumbre del Sol Residential Resort on the Costa Blanca and discover the most pleasant Mediterranean weather. More than 300 sunny days per year to live life at the fullest in a wonderful place, your brand-new home! Thanks to Cumbre del Sol Residential Resort’s privileged location, surrounded by a wonderful natural landscape, you will be able to make the most of the long and bright sunny days by the sea. You will have the chance to see spectacular dawns and sunsets with your own eyes, surrounded by tranquility and amazing landscapes. There’s no better way to start your day witnessing a breathtaking sunrise and end it while contemplating the sunset from your private terrace, enjoying the amazing view over the Mediterranean Sea during breakfast or dinner. Celebrate spring in your new Blue Infinity luxury apartment! These modern properties have been designed with comfort in your everyday life being one of the main. Moreover, thanks to their 40m2 terraces, you will be able to enjoy every minute of sunlight, every day. Why don’t you take the chance to go for a dip in the swimming pool during the hottest days of the year? Our development includes access to amazing communal areas with large terraces and an infinity pool! When it gets a little bit colder outside, you can relax in the wellness area with a heated pool, sauna and steam bath. One of our most important developments refers to Montecala Gardens luxury apartments. You can choose among several models of these recent and modern buildings: ground-floor apartments with terrace and garden or apartments on the upper floor with terrace and some of them even include a solarium. Their distribution has been designed to make the most of the Mediterranean sunny days, in every room. The apartments are the ideal choice, both to enjoy the summer at its best, and to live the rest of the year in this warm Mediterranean climate. This development offers complete communal areas: you can have a dip in one of the three amazing swimming pools, while your children are having a good time in the play area, or you can invite your friends and family over for a barbecue and live wonderful moments together. 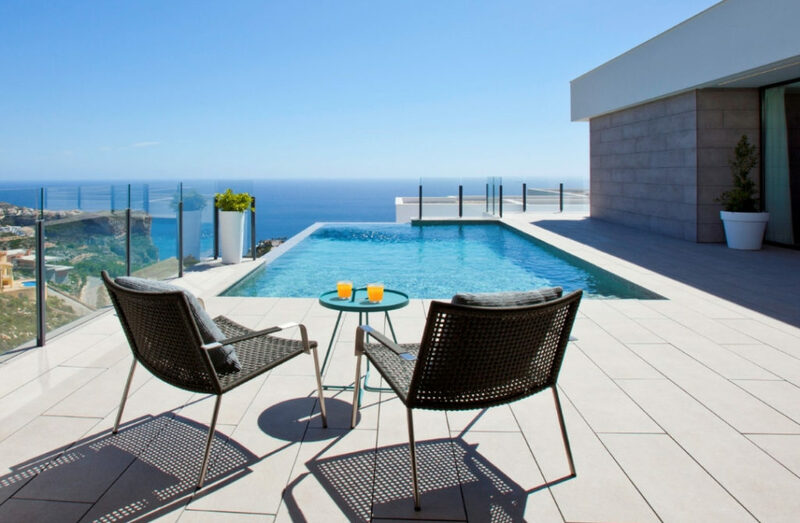 If you prefer the kind of privacy a luxury villa may provide you, we have a wide range of exclusive and modern villas situated in the most amazing places of the Costa Blanca. We are sure you will find the house of your dreams here, where you will enjoy warm weather during 365 days a year. Among our luxury villas you can find Siros XL, that belongs to the Lirios Design development, situated in Cumbre del Sol Residential Resort. This villa has two floors, with a terrace on the upper floor and another one on the ground floor. Each home stands alone and offers its own parking area, private pool, plot with boundary walls, and garden: all you need in order to enjoy the sun every day of the year. If this caught your attention and you would like to have more information about our developments of villas and apartments in Cumbre del Sol Residential Resort, don’t hesitate to contact us filling in our contact form. We will be delighted to help you find your new home in Costa Blanca! Views of the Mediterranean, peace and tranquillity, and above all, lots of sunshine. This could be your life at Cumbre del Sol Residential Resort, a private residential complex by the sea where you can enjoy the wonderful sunsets from luxury properties which offer all the features and services you need. If you are looking for an apartment, it’s time to stop your search! Here at VAPF we have the perfect choice for you: our Blue Infinity luxury apartments. Blue Infinity is a private complex with security which brings all the style and exclusivity you are looking for to apartments of over 220 m2 with terraces starting from 40 m2. 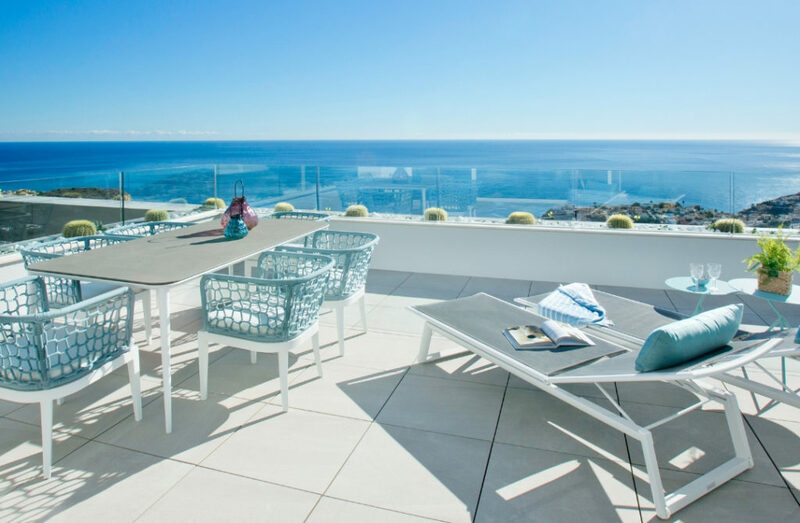 The building, which has a modern façade, faces the sea and is constructed in a tiered structure in which each floor is a “step”, so that every terrace enjoys the brilliant sun which shines almost 365 days a year on the Costa Blanca. In this development, we have several property models: they have either 2 or 3 bedrooms but in all of them the living room and master bedroom connect to the private terrace. Furthermore, all the properties offer the highest quality and the best features, such as underfloor heating, air conditioning, and home automation. In addition to the private terrace included in each apartment, the communal areas on the ground floor will make you fall in love with this development even more. This is a space designed for the leisure time and wellbeing of all residents. The spacious terrace, with a large infinity pool, is the ideal place to unwind while enjoying the Mediterranean climate by cooling off in the water or sunbathing. In the wellness area, you will find a wonderful heated pool and relaxation zone where you can socialise with your neighbours and guests – an outstanding feature for those who like to carry on swimming all year long. In addition, the Blue Infinity communal areas include a private gym for residents… so getting in shape has never been easier! It’s not all about sport here though, and the communal areas also offer much more relaxing options such as the jacuzzi or the Turkish bath and sauna for eliminating toxins after exercise. You’ll have all this available to you with no need to leave the building! Cumbre del Sol Residential Resort is a paradise where you will have everything that you could need. As well as all the features of your Blue Infinity luxury apartment, there are also a range of services available in the area. For example, you’ll find sports facilities such as the padel courts and horse riding centre; the Lady Elizabeth School, which provides an excellent international education for your children; and a shopping centre with a supermarket, a beauty salon, and a pharmacy, among other services. Don’t wait any longer… it’s time to begin your new life in Blue Infinity! Request more information by filling in our form because we will be delighted to help you find your new home. 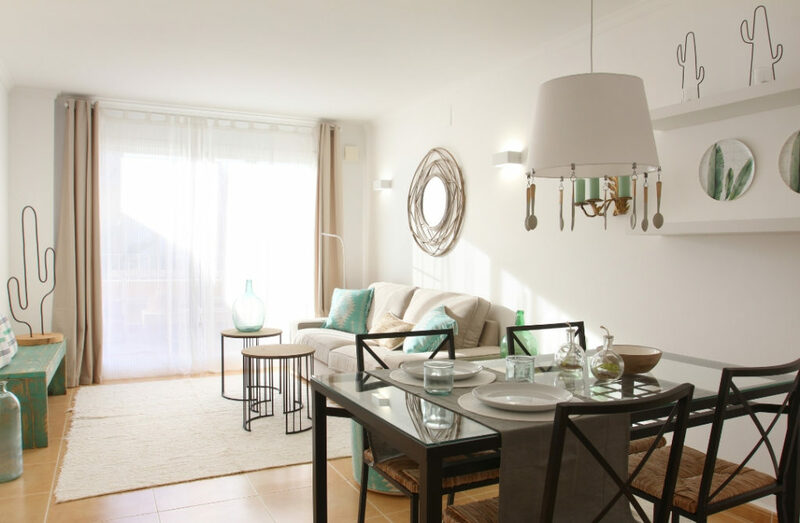 Our new Montecala Gardens apartments are waiting for you! Discover our new development of luxury apartments, Montecala Gardens, situated in Cumbre del Sol Residential Resort in the heart of the Costa Blanca – it’s the perfect place for your new dream life. Enjoy the more than 300 days of sun per year from your new home with incredible communal areas. Don’t wait any longer – let Montecala Gardens become your new home! All the property models in this development offer two bedrooms and two bathrooms. 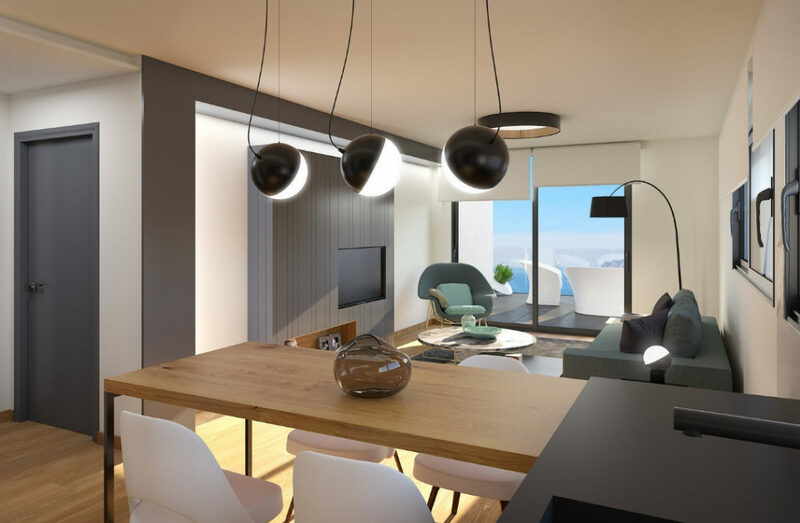 These are apartments with modern architecture and an area of over 100m2 and you can choose between several models: ground-floor apartments with terrace and garden or apartments on the upper floor with terrace and some with a solarium. The apartments on the ground floor have a covered terrace as well as a private garden while the apartments on the upper level offer a private terrace which is an ideal place to relax, sunbathe, or simply enjoy the wonderful surroundings. The kitchen and the living room are joined, creating an open space which allows the natural light to fill the entire room and takes full advantage of the Mediterranean climate. In addition, these apartments are equipped with everything you need to offer you maximum comfort: they include air conditioning and heating with thermostat, underfloor heating, and the generation of domestic hot water. On the hottest days, you are sure to appreciate it when your house welcomes you home with air conditioning and, during the winter months, the underfloor heating will make sure that you are comfortable and feel right at home! Electric appliances are also included and the apartments have modern and exclusive decoration. To ensure that you feel as safe as possible, our Montecala Gardens development includes an alarm system. Everything you need to feel safe and protected in your own home! On the hottest days of the year, why not enjoy the communal areas by going for a dip in one of the pools or sunbathing on the large terraces. These communal areas also include gardens, a social club, parking, and a children’s play area, so you will have everything you need to relax and enjoy time with your family or friends. 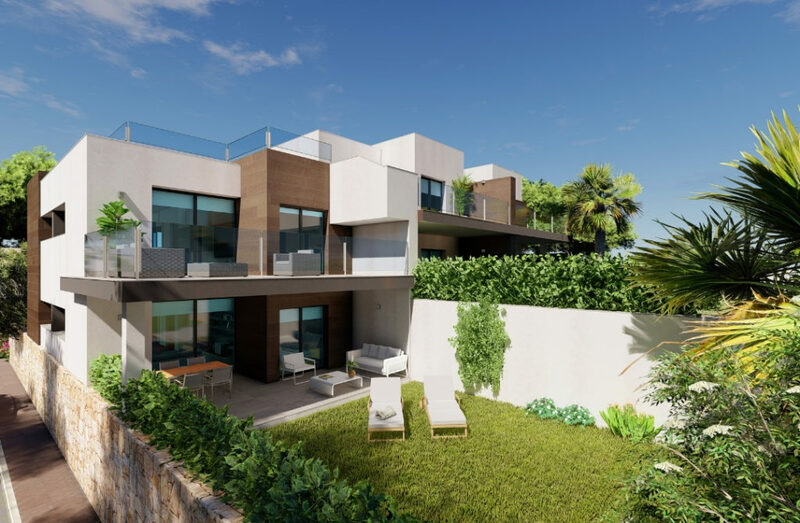 The Montecala Gardens development is situated in exceptional surroundings, allowing you to enjoy nature and the views of the Mediterranean Sea. When you live in Cumbre del Sol Residential Resort you will have the best of both worlds: you can enjoy the tranquillity which comes from living in an incredible house by the sea while also having all your day-to-day services within reach. For example, you will find a supermarket, a hair salon, a pharmacy, and cafés and restaurants. You can also make the most of the proximity to the Costa Blanca’s main cities such as Altea, Benissa, and Javea and their wide range of cultural options and services. In addition, thanks to the incredible natural environment where Montecala Gardens is situated, you will also be able to take part in all sorts of sports and outdoor activities. How about cycling or following hiking routes such as the one which leads to the beautiful Cala Llebeig? 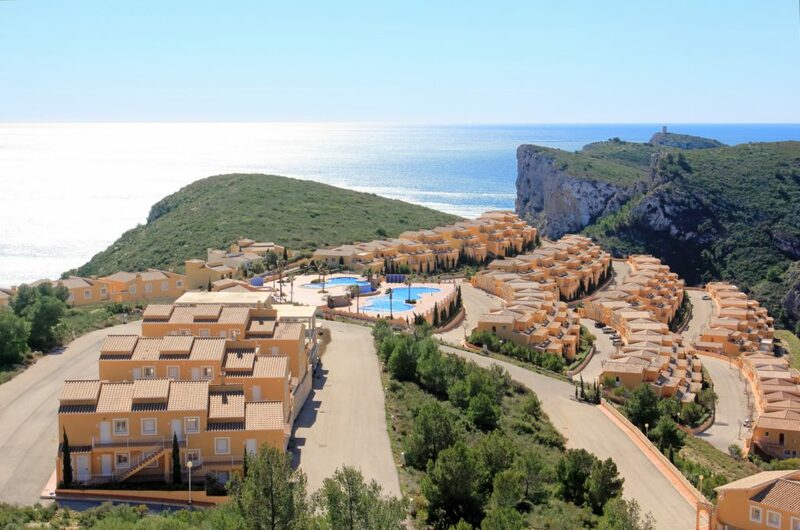 Montecala Gardens has everything you need for your life on the Costa Blanca, from €217,000! What are you waiting for? Get ready and join our community of home owners. If you would like more information, don’t hesitate to fill in our contact form. We will be delighted to help you! Enjoying the Mediterranean climate all year round, nature, incredible views, beautiful beaches and coves, and your luxury seafront home… all this and much more is waiting for you on the Costa Blanca! Would you like to experience it for yourself? If you want this to be your daily life, come to live on the Costa Blanca! It doesn’t matter whether you’re looking for a villa or a luxury apartment, at VAPF we have a large selection of properties for you to choose the one which suits your needs. 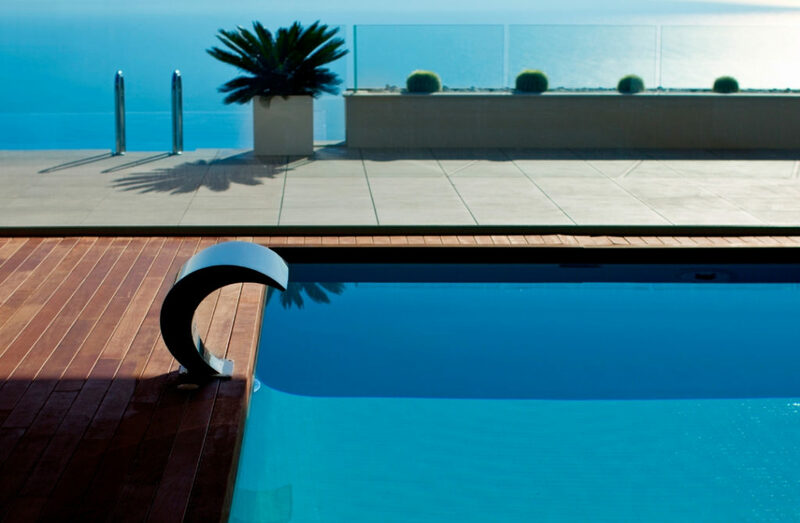 Don’t put off your dreams any longer… make the Costa Blanca your new home! At Cumbre del Sol Residential Resort, we have a wide range of luxury property options: from apartments to different types of villas. If you decide to live in this location, you won’t have to give up anything because here you’ll find everything you need in your daily life: a supermarket, a hairdressers, a pharmacy, restaurants, and even one of the most prestigious international schools in Spain: the Lady Elizabeth School. In addition, you will also find a wide range of outdoor activities such as tennis, horse riding, and hiking. If to all this we also add privacy and relaxation… what more could you want? 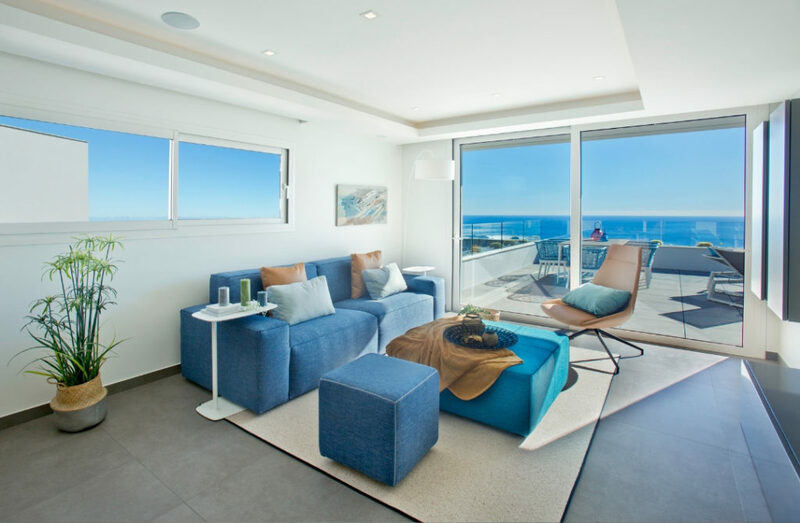 If you choose our Blue Infinity luxury apartments, you will enjoy incredible sea views from your own terrace. You can choose between two different property models: three bedrooms and two bathrooms or two bedrooms and two bathrooms – it’s up to you! These homes are ideal for living all year round or as a dream holiday home. 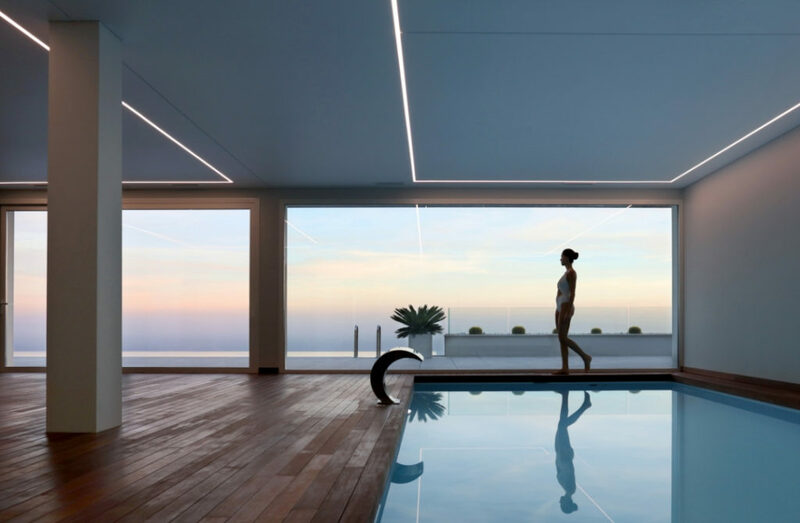 If you choose Blue Infinity, you also choose exclusive communal areas that are perfect for relaxing 365 days a year – on the warmest days you can cool off in the infinity pool. The rest of the year you can choose to rest and relax in the indoor heated pool or enjoy its wellness area with jacuzzi, sauna, and Turkish bath. There is also a gym! If you are looking to live in a home with more privacy, let yourself fall in love with our selection of luxury villas. 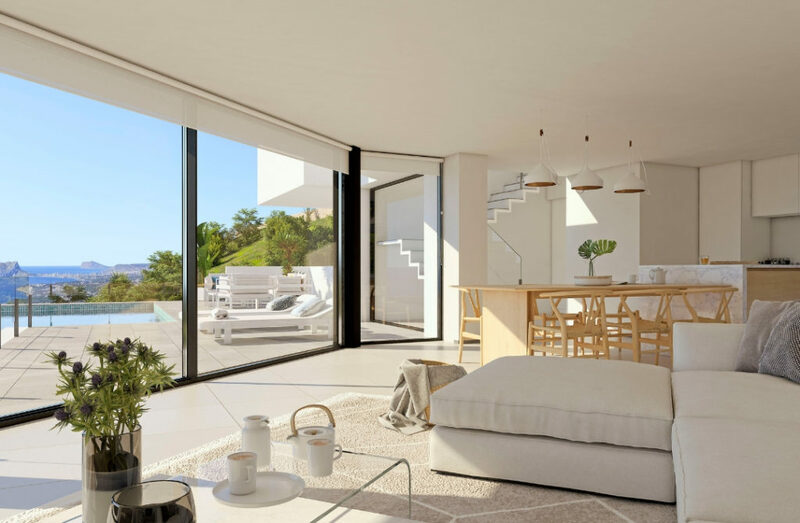 In our Lirios Sunrise development all homes are designed to make the most of the daylight hours and on the clearest days, you can see the island of Ibiza from your terrace. A luxury for the senses! The Villa Albor model has large spaces and includes three bedrooms and three bathrooms. The house is distributed over two floors, with almost everything on the main floor. The ground floor has been designed so that you can put it to the use you want or even create a separate house – it is 68 m² and has its own private terrace. You could also opt for our Siros XL villa in the Lirios Design development. This home has a large living room, four bedrooms, and three bathrooms, and the windows allow natural light to flood every area. Relax outside at your own home – you decide whether that’s in the swimming pool, on the terrace, or in the Mediterranean garden. Another of our most outstanding developments awaits you near one of the most famous cities on the Costa Blanca: the beautiful city of Altea. This picturesque place offers you a wide range of cultural and leisure activities, as well as incomparable nature and incredible views of the crystal-clear waters of the Mediterranean Sea. Here you will find our Blanc Altea Homes development. 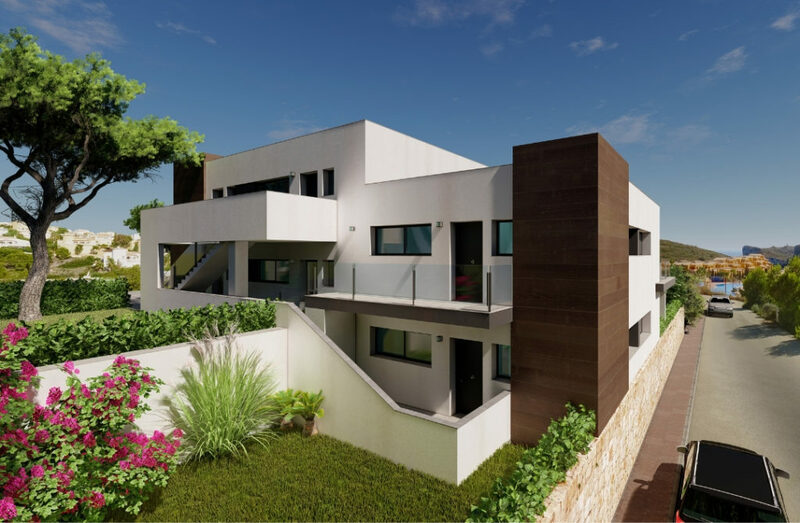 If you are looking to live in a house flooded by sunlight, with spacious interiors and unique architecture, Blanc Altea Homes is ideal for you. These villas have everything you need as you can choose between a villa with three bedrooms and four bathrooms or one with four bedrooms with five bathrooms. Both models include an open kitchen. On the terrace you will also have your own private pool, the best way to say goodbye to the heat, while a luxury addition offered by these homes is the barbecue area, closed garage, and lift. If you want to live a new life on the Costa Blanca, don’t hesitate to contact us by filling in our contact form – we’ll be delighted to make it your home!